As most of my readers already know, I have an iPhone. That 8 gig machine is amazing and enough for any sensible person. So I hadn't bought an iPod touch. I thought maybe I would get one for Christmas. But, then I finished my Studio Manager product. As I was sitting in a crumpled heap, totally exhausted and depleted, a brilliant idea occurred. I could get an iPod touch as a reward for my extraordinary efforts and accomplishment of getting the new software out the door. Thin. All of a sudden my iPhone seems thick and clunky -- just a little bit. The iPhone does seem large, almost bulky once you hold the two, one in each hand. Really glad the iPod touch is so skinny. Here's the plan. I haven't jailbroken my iPhone and am patiently waiting until February or whenever more apps show up for it. But, I plan to very soon jail break the iPod touch and use it as my play ground, saving my iPhone in its pristine condition. Of course, it is quite possible that once I jail break the iPod touch and start having more fun there, I will feel constrained with my stock iPhone. I'll cross that bridge when I come to it. I do have to say that the video on the iPod touch is great. The iPod aspect is good but it is not quite as nice as the iPhone 9 (lack of volume buttons, speaker...). However, there's 16 gigs of space and it was really easy to exceed 8 gigs. I am posting here in case a few of my readers have or have an interest in the iPod touch and in jail breaking these things and in native apps for iPod touch and iPhone. Let me know you guys. I just read a Christopher Breen article on PlaylistMag.com and he tells you how to simply get Mail and Maps onto a 1.1.1 jailbroken iPod Touch. It is even easier to copy the Weather, Notes and Stocks applications to your Touch. That's more like it! I still would miss the volume control buttons, speaker and camera, but the apps along with Safari and 16 gigs might be pretty cool. A waaay better iPod than any other we've seen to date. On its own merits, without comparing it to an iPhone, the iPod Touch is a great device. I said on September 11th that a crippled iPod Touch won't fly. Well, I was wrong. Especially if you jail break and soup it up. I don't own an iPod Touch, but jkOnTheRun has a great little YouTube video review you might like if you are thinking it might be right for you. I just downloaded my first Amazon download for 89 cents! I had to download a small downloader application first (a beta). I had to quit Safari to complete the install. Luckily I didn't have my usual massive number of tabs open, but heads up on that. The downloader put the song right into iTunes for me. This is quick and easy! I am glad to see Amazon making a credible entry into the music downloading business to provide competition to Apple's iTunes. I'm even happier to see they are doing a DRM-free, relatively high-quality offering. They have two labels, Universal and EMI, so far. Like anyone, I prefer to skip DRM. Now I can get a lot of music without DRM at a reasonable price. I intend to buy single songs at 89 and 99 cents per song. This deal beats Apple's 1.29 cent price for their DRM-free songs. Apple has the edge in two areas. First, the iTunes store is way better overall. But, Amazon has better search and I hope that means Apple will give us some decent search to augment their current strengths. Second, Apple uses AAC encoding and Amazon is using MP3. AAC gives you a notch better quality at the same size. So, Apple's DRM-free music is a little bit better and that difference would probably be noticeable on high quality headphones or high-end speakers. There is one caveat, though, which is that MP3 is supported everywhere and AAC is only supported on some players. 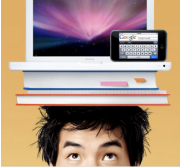 If you are an iPod user, you'll be able to take advantage of AAC. I will continue to use the iTunes store and also check out the Amazon store in some detail. I will report back on my experiences. Right now I want to support the Amazon DRM-free offering, so when I find something I want on the Amazon store, I will purchase there. When I find a single song on iTunes that I want, I will just buy the DRM-free version there and pay the extra 30 cents. It isn't worth the trouble to go back and buy it on Amazon and I get the small AAC quality advantage to boot. If there is no DRM-free version on iTunes, I'll buy there only if I don't think the DRM-free version is available on Amazon. DRM-free takes precedence because the convenience later in moving the song to different machines will make up for the inconvenience now of having to find the song again on Amazon. Keep in mind that Apple wins either way. 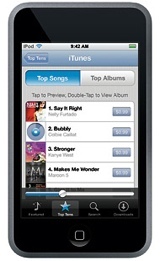 More good DRM-free music will drive iPod and iPhone sales. Besides, the competition will inspire Apple to do better work. Finally, we want legal DRM-free music. Amazon, by joining the DRM-free side of the argument, will pressure the other labels that are holding out to open up their music too. This is good! 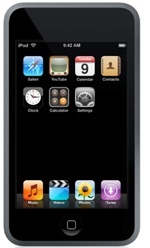 It is clear that the iPod Touch could have all of the hardware-independent applications the iPhone has. But Apple has deemed to cripple the Touch to, it seems, moderate cannibalization of iPhone sales. You do get a Contacts button that the iPhone doesn't have but you don't get notes, weather, google maps, stocks or email. That's BS! Pre-iPhone, I always felt constrained with the lack of input on my iPods. I knew they could have offered much more. Minimalism has its limits. We want more from these little devices because they can take the place of notebooks, notepads, address books, calendars and sometimes computer notebooks when we are traveling light. Not everyone wants or needs an AT&T cell contract. Apple hasn't made deals yet outside the US and they are going to sell the Touch right away in all 22 countries they operate in. I'm wondering if Apple can get away with this transparent crippling without creating a big backlash that makes the iPhone price drop fiasco look tame. I see their approach very handy for them. They start with maximal crippling then perhaps turn features back on one or more at a time when and if cannibalization seems under control. Great way to do things if you've never read the Cluetrain Manifesto or just written a letter about trust and trying to live up to your customers high expectations. Put me on record as predicting an uproar once people buy these things and find out they are crippled. Not the iPhone without the phone. I made it over to the Apple store a few minutes ago. Played with some new nanos. Trying different colors to see which I liked. The screen is really good. TV-watching should be fine. I liked the *black* one the best. It looks coolest. I was surprised to see that the back side is chrome now. My second favorite was the Product (red) one. This is a tiny, light and cheap way to get into iPod video. The video and the gorgeous bright screen are the primo features here. The $79 1-gig shuffle has stiff competition now with the fuller-featured 4 gig nano for $149. If you are wondering. I didn't buy one. First, I haven't got my $100 credit yet. Second, I love my iPhone and am not sure I want 2 devices. I want a 16 gig iPhone, the sooner the better. If a 16 gb version is released soon, I will try to find a way to buy one and sell my 8 gig. But there is another side to this. The $399 price for the 8 gig iPhone makes room for something above it. The 16 gig iPod Touch is shipping in less than 2 weeks. When does the other shoe drop on this iPhone price cut? People got mad to see the price drop so fast on the iPhone. Steve's $100 credit for the early adopters soothed ruffled feathers. But, don't tell me they won't get re-stimulated if Apple sucker punches geeks with tight pocketbooks who buy $399 8 gig iPhones only to see 16 gig iPhones a week or two or even a month later. That won't go over and will continue the *let's extract every last cent out of customers* mentality that may have driven the $599 for 2 months and cut to $399 pricing plan. Could you surf an iPod Touch with a 3G phone? Just a thought. Thinking a 3G-phone-owning enthusiast could hack the Touch so that it could use the 3G phone as its modem to get on the Net. That might be an option for fans who would like that big, beautiful Touch screen but already like their faster 3G phones.